(Newser) – Florida conservationists are reporting a right whale calf sighting off the state's Atlantic coast. In a Facebook post, the Florida Fish and Wildlife Conservation Commission's Fish and Wildlife Research Institute said it's the first calf sighting of the critically endangered whale's winter calving season. "The weather outside may be frightful, but endangered species observers ... spotted the first North Atlantic right whale calf of the 2018-2019 season!" reads the post in part. 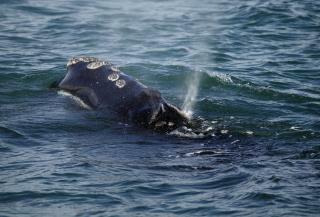 Scientists estimate only about 450 North Atlantic right whales remain. No newborns were reported during the last calving season, and just five calves were counted during the previous year, reports the AP. Right whales typically migrate from the North Atlantic to give birth off the coasts of Georgia and Florida from December through March. Wildlife officials said the calf and its mother were spotted Friday offshore near the mouth of the St. Johns River. The commission said the mother had been spotted five days ago off the Georgia coast. Well, I know where Darth and Gart are. Fabulous. Come on back whales. Its time to return to glory. Have a long life and avoid humans. Or better yet, eat them.